Hey everyone! I might be sick as a halloween cat after a bag of chocolate, but I still have a Friday video for you! On Instagram I was asked to do a video on a similar image where I did a spooky coloring spotlight, so I figured I could do a quick video. A little spooky music will carry you through the short video – if you can’t see it below on your device, click HERE to go watch it on YouTube. The stamp set also has coordinating dies – I’ve linked to both below for ya. By the way I created this video yesterday in a new version of the software I use; I’ve been using Final Cut Express for eons, and downloaded regular Final Cut recently. It’s like editing a video while wearing someone else’s sweater! Stuff isn’t in the same place, and I don’t yet know how to do transitions. But, on a really good note, it took less time to render, AND I could edit it on my laptop. Which is good news when I’m sick! 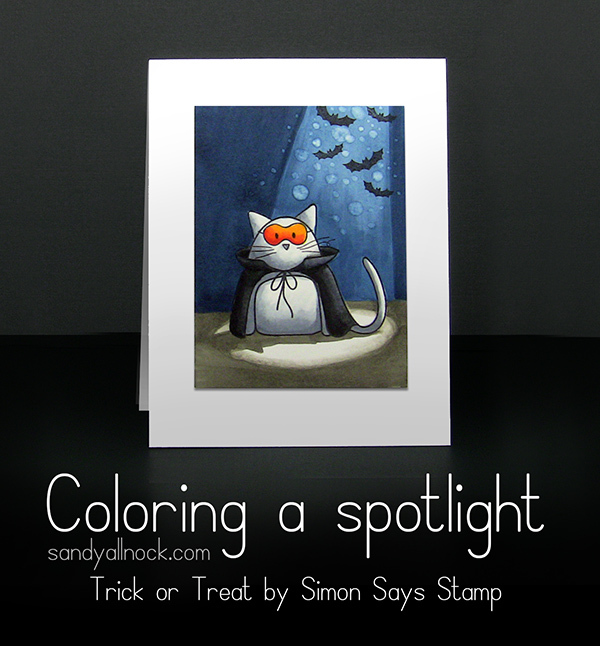 It’s the halloween season…plenty of spooky coloring to be done, so get to it! Your freehand items blow me away! Sandy, Hi I’m so happy to added myself to your blog. I’m learning a lot about copic thanks a bunch. Speechless!!! I gotta try this!! Such dimension in such a simple image, but you really make it come alive! mannie (Kristinas kitty) looks so darn cute! You mastered the background I must say. The spotlight is awesome, how do YOU see things that way in order to color that? I apparently cant see the potential in me. Checking Kristina’s blog today brought me here – and OMG I will have to come visit more often. Amazing, awesome work. Bravo! What an incredible coloring job. I don’t remember seeing a coupon code listed before in your previous posts about the classes. Oh well, it’s only 3 bucks difference. (I get the blog posts a day later than most others, it seems.) Off to watch the video. It was only posted the other day by Copic – it’s not my code. I shared it as soon as I could. LOVED the silent-movie treatment, complete with theme music. And your colouring is inspiring as always. Continue to rest that voice! (professional advice from the Speech-language Pathologist). Take care of yourself and feel lots better. Oh my, the coloring and the music together are so FUNNN!!! Thanks for the reminder to sign up for class. Doing that now. God bless you with healing! Proves the old saying – a picture is worth a thousand words. If you had spoken a thousand words, you could not have demonstrated beautiful coloring any better. I am so sorry that you are still under the weather. Praying that you are back on your feet real soon. Thanks for doing an awesome video and card. Loved watching how you did the spot light. Happy Birthday OWH. OMG that video is awesome. I am sorry your feeling down. I loved the music. I wished it would have gone just a touch slower. But I dont think that’s because I needed to understand it better, I think it’s just because I love watching you color. I can’t wait for class to start. I wish your sister good luck in her election and can’t wait to get the images I purchased from you. Please consider adding a donate button to your web site. I do not want an addtional monthly commitment as I am helping several of my family members with financial difficulties and this will not change in the foreseeable future. However, I still try to donate when possible to sites that inspire me. And your site is definately one of those sites. You know, sick or not, you’re amazing. Love to watch you color. Get well real soon. Amazing! I really loved the video!!!!!!!!! Hope your voice comes back – but that you still do a video like this now and then! I really enjoyed seeing the color you were using lying next to the image while you were using it. This was definitely a different kind of post. Loved watching you color and bring it all to life. Hope you feel better soon. Happy Birthday & Congratulations to YOU! You’re backgrounds are amazing!! You make a single image more versatile. Sometimes people say I’m creative but I’m just a drop compared to your ocean of awesomeness. Lesson: Kids, follow your dreams! (How about a fun, creative challenge for some sparetime in the future: Making cards for the different seasons/holidays of the year, using the exact same image?) Hope you feel better soon. Hope you get better soon. Great card.